There is no way I would want to be in that ring with those two men! Non vorrei essere in lotta con questi due pugili!! Questi uomini significa guardare! That has got to hurt. You captured the fight and the photo looks good. Great shot. I like the pose, the moment of you captured in this fight. 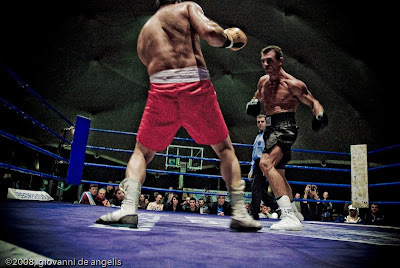 Cool shot!, I have been wanting to capture this kind action in boxing ring. Louis la Vache has added a link to your Photo Blog at his new "San Francisco Bay Daily Photo" blog. Wonderful point of view and love the effect of the wide angle lens. Did you add the vignetting or is that from the lens?